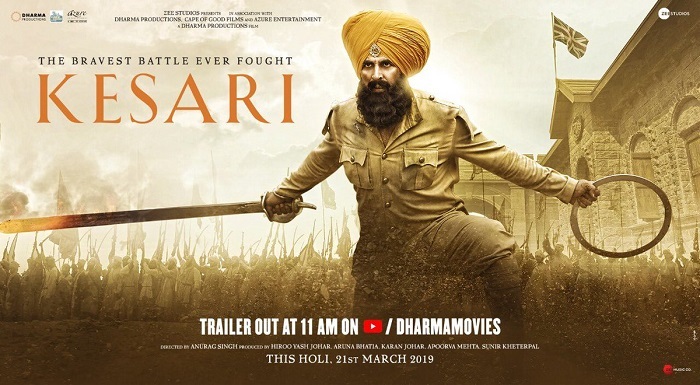 Kesari 5th Day (Monday) Collection Early Trends, Good Hold! Kesari has shown good hold on Monday (5th day) at box office as early trends for the day is just arriving. This is good news and it means Kesari has passed the crucial Monday test. Now film is heading towards outright HIT zone. Kesari opened to around 15% occupancy in morning shows. Film showed reasonable growth in noon time and registered an occupancy of around 25-30%. Film further registered jump from evening onward and as per latest registering an occupancy of 44-45% which is pretty good. When Monday samples are compared to Friday then there is a drop of 35% in occupancy. Samples of Friday is given in bracket. It is to be noted that Monday ticket rates are lower than Friday and hence business drop from Friday will be more. Early trend suggest, Kesari 5th day business is heading towards 8.5-9 crore nett mark. These are early estimates from limited samples. Still few shows are left for the day and also major reports from interiors are awaited. Hence, final count will be higher or lower depending on these mentioned factors. How much budget of film ? As it is period film budget should be around 150 crore. And according to present trend lifetime collection will be 150 crore. So how the film is hit? Everyone is in hurry to declare the film as 'Hit'.but being a period war film collected is below the mark. Total investment is 100 crore. So do'nt judge without proper knowledge bro. Have u seen the film or done phd in war films to say it is 150 Cr budget? IPL has affected the collection mind it. Akshay Kumars movie tickets are never over priced. I have noticed it.